Create an imposing persona in one of our Iron Diavolo - Authentic Hand Made Venetian Masks. 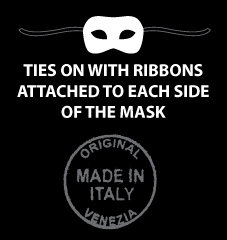 Our masquerade masks are created in Venice, Italy and are reminiscent of the masks worn long ago. The Diavolo mask is the most popular mask among men and features pointy horns, furrowed brow, high cheek bones and a distinct nose. These key features create a daunting character fit for any masquerade ball. Brushed with dark grey and other metallic paints, our Iron Diavolo masquerade masks are quite fierce. Wear our Venetian masks with the attached ribbons for tying to any costume party, masquerade event or down to the wild streets of the French Quarter. Create your own unique masquerade costume by adding a black, silver, or red hooded cloak made by Venetian Mask Society.